Give the bride and groom a wedding gift that they can use for years to come! 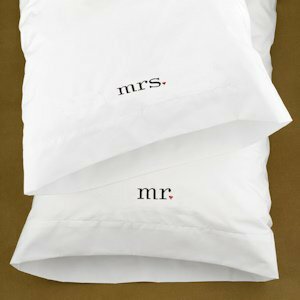 These fun and practical standard-sized white pillowcases feature black and red embroidery that reads Mr. & Mrs. The period after the Mr and Mrs are depicted as a red heart for romantic flair perfect for the occasion. 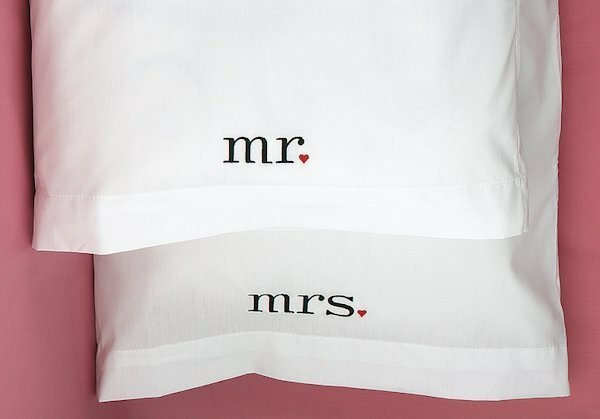 Not only do these pillowcases make a great wedding gift for the happy couple but it could also be the perfect anniversary gift for your loved one. Their design is simplistic and minimalistic which means it is classic and will be loved by many and will go along with any theme that is already in their bedroom. If you were looking to make this gift a part of a set, you could include a luxurious sheet set or items for the bride and groom to pamper themselves with like nice lotions or other bath products so they can relax and enjoy and relax in their married life. Our Mr and Mrs pillowcases measure 30" x 20" and are a blend of polyester and cotton for maximum comfort. Give the gift of comfort and love to the beautiful couple! Feature black and red embroidery that reads Mr. & Mrs. (the period is depicted as a red heart). Our Mr and Mrs pillowcases measure 30" x 20"